Good news! I have sucessfully not gotten sick! I am in tip top shape for my flight tomorrow. Yes, we leave for England tomorrow. I am excited and scared and nervous all rolled into one. I mentioned in my last post how I have been cleaning out the fridge before we go. This is a soup I made that took the ends of many vegetables and made a very hearty soup in my crock pot. As you can see, it was quite hot when I snapped the photo. This soup made enough for the both of us to eat it twice, and to give a considerable amount of leftovers to two of my co-workers. 2 14.5 ounce cans of tomatoes. I prefer Red Pack tomatoes because I love the flavor. I try to get the ones with basil, but they aren’t that easy to find. As for seasonings, I just threw in garlic powder, sea salt, pepper (fresh ground black and white), hot paprika, a splash of Frank’s hot sauce, and a squirt of hot pepper paste , oregano, and parsley, but no basil. Can you believe I forgot to add basil? So, you should also add basil, because basil is tasty. I just dumped and stirred up all the ingredients in the good ole crock pot and let it cook on low heat for about six hours. It was good, but a little thick upon reheating, so when you do reheat it on the stove, add a little water. I served this with croissants, but next time I would like to serve it with pumpernickel. Mmmm pumpernickel. 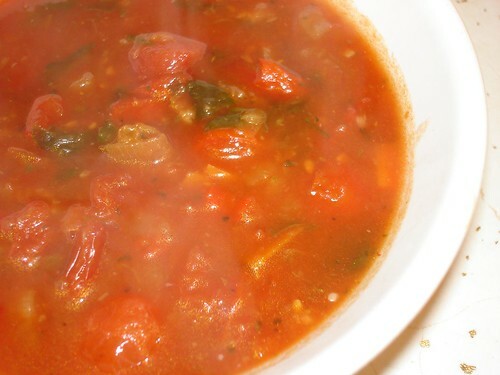 This is a good soup to warm you up as our North Country days get colder. If you make this, let me know what veggies you use. I would love to know your adaptations. Have a great day and keep cooking! We will all get together and talk soon. Oh and one more thing, I do an October Project every year. Basically, I take a photo every day of the month and I post it on flickr. If you are interested in following it, here is a link to the set and here is the feed . Triple decker grilled stilton and pickle sandwich. this looks delicious! need to try to make it. This looks amazing, perfect for chilly days! Love the October Project so far!! !